Superior erosion control – Large, perennial prairie root systems create year-round soil “anchors.” This is particularly notable in a state dominated by annual row crops, where topsoil lacks adequate protection much of year, and has almost no protection during the rainy, spring season. Increased rainfall and runoff infiltration – Healthy, diverse root communities improve soil structure, adding underground air spaces and absorbent organic matter. As a result, water more easily percolates into the soil rather than flowing across the landscape. This helps reduce flooding and keeps sediment out of waterways. Invasive weed control – Dense, underground mats of tangled prairie roots are tough competition for invading weeds. 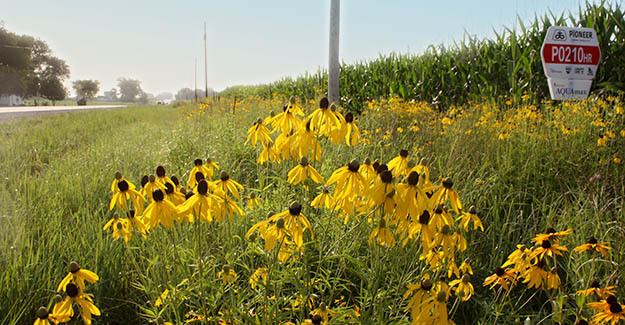 Carbon sequestration – Mature, undisturbed prairies store more carbon below ground than forests can store above ground. Nutrient reduction – Actively growing prairie roots take up nitrogen leaching through the soil from crop fields higher on the landscape. All of the ecosystem services listed above are important along roadways, but especially those that slow runoff and improve infiltration. Ditches exist to move water. They catch runoff from adjacent crop fields, urban landscapes and the roadbed itself. When this water moves too quickly through the ditch into waterways, flooding and erosion occurs. By anchoring ditch soil and improving its absorbency, some of that water and soil stays in place.